I made the following recipe to accompany the various sausages we made for my recent sausage making class. I scored some great deals at the grocery store on bell peppers of all colors - red, yellow, orange, and green - and wanted to use them somehow. On the same trip to the grocery store, russet potatoes were also on sale so I decided on a potato salad that included the bell peppers. To round it out further, I added some cheese and salami. 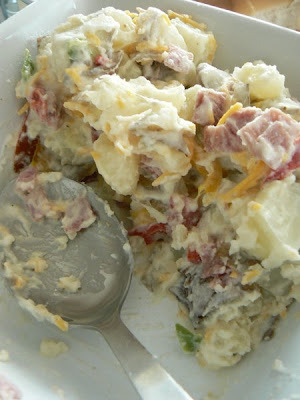 It's a great potato salad on its own or makes for a nice accompaniment, especially during the summer cookout season. I'm not a big fan of tons of mayo so this recipe only calls for 2 tablespoons. Cut your potatoes into 1 inch pieces (your choice if you want the skins on or off - I kept mine on) and place them in apot with filled water. Place the pot over a medium high heat and allow the potatoes to boil and soften. Once cooked, drain and place potatoes in a large bowl; set aside to cool. Prepare your bell peppers by cleaning, deveining and seeding them. Finely dice your peppers or if you prefer, in short strips. Place the peppers in a large bowl with the potatoes. Add the remaining ingredients and combine. Potatoes can either be warm or cold, since this potato salad can be served either way. What a great idea to add the salami. I'm going to have to remember that next time I take potato salad to a picnic. Sounds like a delicious potato salad. Thanks for sharing.